Ellis is the second-most common surname in my genealogy database. These are the 10 resources that I have found to be most helpful in researching these family members. “Ellis and Keener Connections” – a family tree compiled by Lynda Gibbs and housed at Rootsweb World Connect. Some of you are groaning that WorldConnect family trees are inaccurate and that may be true in many cases. This tree, however, includes numerous source citations, and I have been able to corroborate most of the information presented on my Ellis connections. 1900 U. S. Federal Census (available online for $ Ancestry.com and for free (images included) at FamilySearch Pilot). 1850 U. S. Federal Census (available online for $ at Ancestry.com). 1840 U. S. Federal Census (available online for $ at Ancestry.com). 1860 U. S. Federal Census (available online for $ at both Ancestry.com and Footnote.com. Index available for free at FamilySearch Pilot). 1870 U. S. Federal Census (available online for $ Ancestry.com and for free (images included) at FamilySearch Pilot). “Revolutionary War Pension and Bounty-Land Warrant Application Files” (available on for $ at Footnote.com). 1880 U. S. Federal Census (available online for $ at Ancestry.com. Index available for free at FamilySearch Pilot). “Georgia Death Certificates, 1919-1927” (available online for free at Georgia’s Virtual Vault). To see all the deceased Ellis’s in my database, click here. 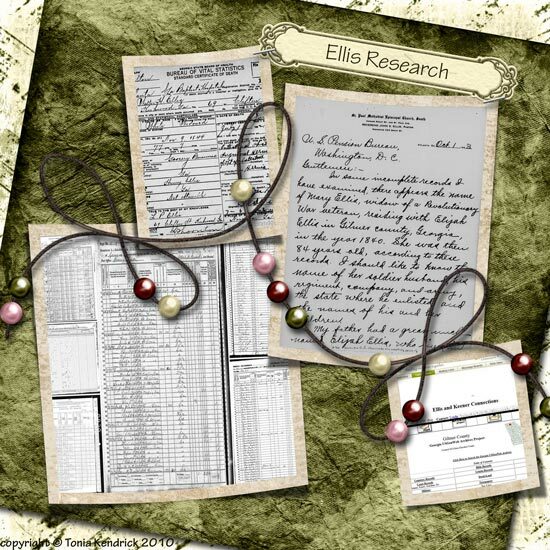 If you have Ellis connections or suggestions for other Ellis research resources, please leave a comment! Note: the collage was created with pieces from the Holiday Sugar Cookies kit by A-liya – Elena Chukovskaya at a-liya.blogspot.com. This post is part of an ongoing series focusing on specific surnames. To see all posts in the series, click here.